If you are living with herpes, and you want to meet someone for friendship or dating who understands and supports you, then MPWH.COM is a dating site that you will want to check out. Note: While uploading a photo is not necessary, you are not allowed to send emails if you don't have a profile picture. Therefore, it is highly recommended to upload a photo to increase your participation on MPWH, as well as gain more interest. An interesting feature to MPWH is the 'Let's MEET!' feature. It can be accessed through the top menu, and it takes you to a page where you can see profiles of members and choose whether or not (yes or no) you would want to meet them simply from their picture. There is also an option for people who are unsure called Maybe. The ability to create your blog or view other member's blogs. It is an excellent way to interact and meet new people. The forums offer a place to discuss dating, current events, and even issues you are having. A great selection of search options to choose from. The ability to comment on someone's profile directly under their picture. It increases interaction on the site, and it allows you to say hello quickly. When looking at a profile, you can easily block the member, report them, or hide them from your search results. You can access everyone that you blocked under the 'My Lists' section in the top menu. There are three membership options to choose from. Please note that the following prices are in USD. All one-month memberships renew automatically, you have to turn off the billing manually. MPWH.com does not screen its members. Therefore, use caution when talking to or meeting members on MPWH. Never give out your personal information and always meet someone by using your transportation and meeting in a public place. 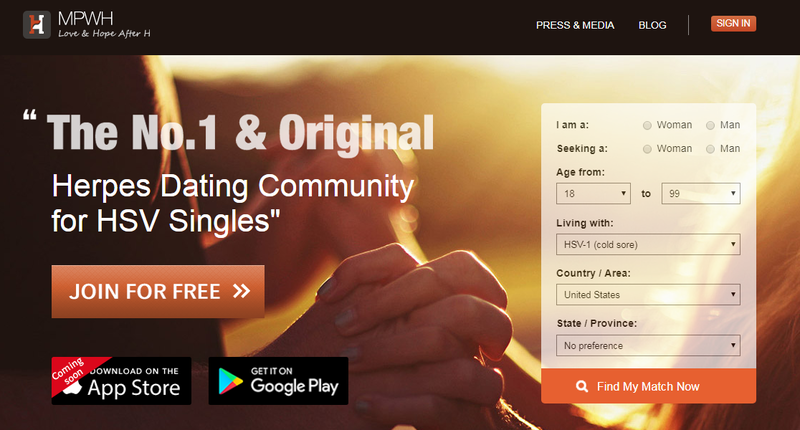 This MPWH review turned up what I expected – a great one of herpes dating sites that has excellent features to help you find the type of relationship you are looking for, whether it be a friend or something more. The signup process is easy. MPWH.com is incredibly easy to navigate through and use. And, with the ability to verify yourself and prove you are who you say you are, your chances of finding someone will go up exponentially. Copyright 2018 DatingSitesWithHerpes.com. All rights reserved.